The sportcoat is a black, tan and white tick (I think that's what "They" call it). I've had it for a really long time. It's a Robert Stock and I couldn't even begin to try and remember where I got it or when. The lapels look pretty big on it. The dress shirt is the off white (ecru, says the catalog) pinpoint oxford, straight collar. A little too much starch in the collar this time around. 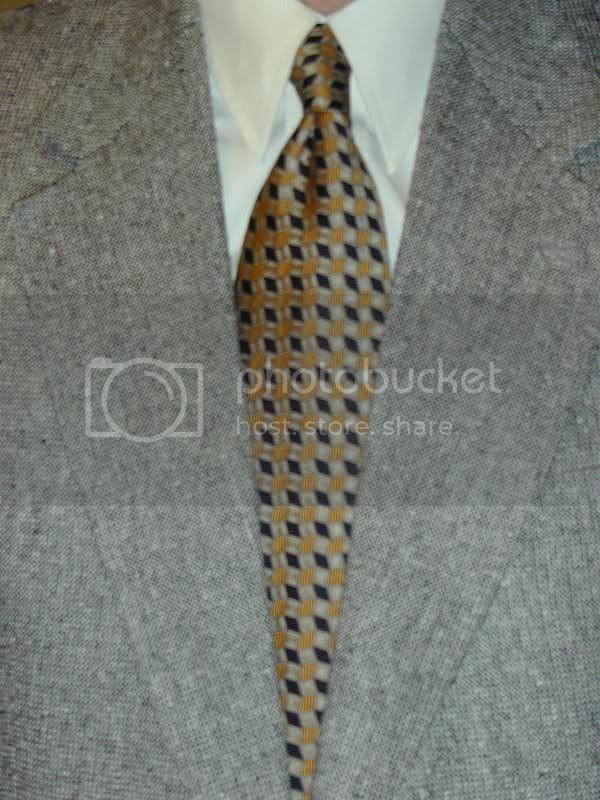 The necktie is a Ferrell Reed, City of London. It's a black background with gold criss-crossing over the top of the black. Ferrell Reed makes pretty nice neckwear but the City of Londons are a notch above, in my opinion. I'm not sure they even make them anymore. The widths and the general look of the ones that I have tend to suggest that they're several years old. I've liked them for quite some time and have purchased several from Ebay vendors. They're usually pretty cheap too.